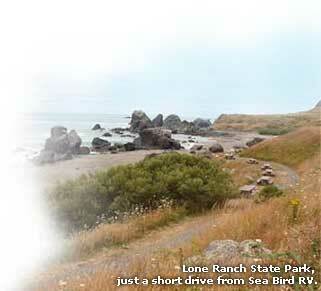 Don and Sheila Sparlin, owners of Sea Bird RV Park, would like to welcome you to the southern Oregon coast. Sea Bird RV Park is located on highway 101, just south of the Chetco River Bridge in Brookings, Oregon. Our quaint park is encircled by trees making it very quiet and private. We are within walking distance to the Brookings harbor, beaches and shopping. We hope that you will come stay with us. If you love the outdoors we have plenty of that! Lush green forest, miles of sandy beaches and lot's of incredible weather. Average temps: 60s and 70s from April to November. These are just a few choices! Reservations are required. Keep in mind, that May through October is our busiest time of the year. November through March is not as busy but reservations are still required.